3M Perfect-It Gelcoat Medium Cutting Compound + Wax combines fast cutting power, a high gloss finish and durable wax protection. Use this for any P1000 and finer scratches. 3M Perfect-It Gelcoat Medium Cutting Compound and Wax's improved formula has longer wet times for easier clean up and less dust, even in warm climates. 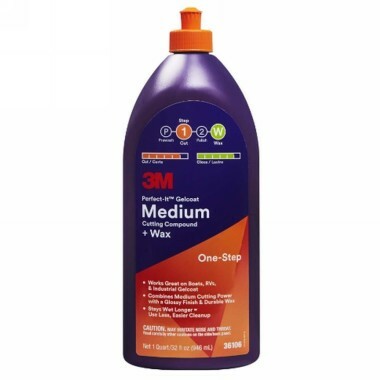 3M Perfect-It Gelcoat Medium Cutting Compound + Wax works great on boats, caravans and industrial gelcoats. This one-step solution results in a brilliant finish and long-lasting protection for any of your gelcoat surfaces.